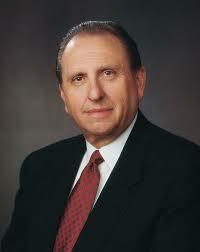 Last night I felt a special love for Thomas S. Monson, our current President of the Church. Since he will be speaking again this morning in our general conference, I wanted to share some of my feelings about this man Latter-day Saints sustain as prophet, seer, and revelator. As I’ve written about before, when I was 11 years old my father unexpectedly died. Because my grandparents had been friends with the Monsons for many years, Thomas Monson – who was then 1st Counselor to Church President Gordon B. Hinckley – spoke at my dad’s funeral. At the time I met him very briefly. I never expected to meet him again. Well several years later, I did. As a young teenager I happened to meet him backstage right before he was to speak at a large gathering. He invited me to sit next to him. He then put his arm around me and for the next 10 minutes treated me like I was the reason he was even there. Without being told anything other than my name, he launched into a brief history of how he knew my family and how much he valued his friendship with my grandparents. He asked about my immediate family – how we were doing, how I was doing, and encouraged me to be good to my mom and to help her. And while I don’t remember everything we talked about, I do remember, like the cliché, how he made me feel. By any conventional standard, I certainly should have been the least of his worries that night. I’m still amazed that he demonstrated such concern for a little teenager he happened to run into right before his big talk. While it is a compliment to him that many of the great and mighty of this world know and honor him, perhaps it is an even greater tribute that many of the lowly call him friend. Thomas S. Monson points others to Jesus Christ, by word and deed, to live and love and serve as the Savior did. I know TSM is not a perfect man, but he is a very, very good one. More than that though, I believe him to be a special witness of Jesus Christ. When I study TSM’s messages or hear him speak, I feel the Holy Ghost affirm that he is a prophet of God – a modern Moses. I sustain him as such and look forward to hearing him today at conference (morning session begins at 11am CDT). Watch the proceedings live here and follow on Twitter here, hashtag #LDSconf. Let’s define some words and phrases. This will surely be a growing list, but let’s get started with some essentials. Mormon Church, LDS Church, or Church of the Latter-day Saints. Attempts to shorthand the formal and official name of the church, The Church of Jesus Christ of Latter-day Saints. Mormon. Has a couple of meanings and uses. Mormon could refer to 1) members of the Church of Jesus Christ of Latter-day Saints; 2) the prophet-historian figure after whom the Book of Mormon is named; 3) fundamentalists who have broken off from the LDS Church. Throughout this blog, I’ll use both Mormons and Latter-day Saints (LDS) interchangeably (not to be confused with #3, which, if ever brought up, will be referred to as Mormon fundamentalists). Check out this page for some additional links and info on uses of Mormon. Book of Mormon. Religious text held by Latter-day Saints to be scripture, comparable to the Bible. Recounts several ancient Israelite migrations to the Americas – their histories, prophecies, and rebellions and relationship with Deity. Contains an account of the resurrected Jesus Christ visiting these inhabitants. The text originated from a set of ancient metallic records Joseph Smith discovered and translated. Published in 1830 in New York. Church. Chapel. Meetinghouse. Ward building. Stake Center. Basically, all these refer to a Mormon meetinghouses where Latter-day Saints gather on Sunday for their worship services and which are used for activities such as baptisms, socials, youth activities, athletic events, and dinners. Visitors are welcome. In June 2013, church leaders announced that LDS meetinghouses will now be open for tours during weekdays. Temples. Temples are different from Mormon chapels, which as noted above, are designated for Sunday worship services. An LDS temple is considered to be the “House of the Lord” by Latter-day Saints. Upon dedication, temples are believed to be sacred structures where essential ordinances, ceremonial rituals and marriages are performed by Latter-day Saints for themselves and their deceased family members. The ordinances and ceremonial rituals reflect Old & New Testament themes and elements. Latter-day Saints visit and worship in temples to make promises with God and draw closer to Jesus Christ. Ward. An LDS congregation is called a ward. Each ward is defined by a geographic area. Thus, Mormons do not necessarily select the ward they attend each Sunday, only to the extent they choose the neighborhood in which they live. Overseen by a lay bishop and two counselors. Stake. A group of LDS congregations or wards (usually 6-10). Overseen by a lay “stake president” and two counselors.